Leicester XI: Schmeichel, Simpson, Huth, Morgan, Fuchs, Albrighton, Kante, Drinkwater, Schlupp, Mahrez, Vardy. Palace XI: Hennessey; Mariappa, Dann, Hangeland, Kelly; McArthur, Cabaye; Puncheon, Sako, Bolasie; Campbell. Jamie Vardy scores for a seventh Premier League game. Leicester keep their first clean sheet of the season. And the Foxes are up to fourth. A good day for the home fans at the King Power. Is that Palace's last chance gone? Jamie Vardy is booked for a rash tackle as he puts pressure on Palace defenders. Hangeland up front for Palace. Leicester fans chanting "we want pizza". Wilfried Zaha darts past Christian Fuchs in the box and flops to the floor. Penalty? All eyes on Mike Dean. Who brandishes yellow for Zaha. Replays prove inconclusive. Zaha was looking for contact but Fuchs's trailing leg was outstretched. A bit of confusion on the edge of the Leicester box as Christian Fuchs and N'Golo Kante get in each other's way, but Patrick Bamford can't take advantage, dribbling a tame shot at goal. Nathan Dyer, on loan from Swansea, replaces Riyad Mahrez for Leicester. Goalscorer Jamie Vardy has run nearly 9km in this game but it's the effort level which impresses most as that includes 50 sprints. No player has sprinted more. The former non-league players is prepared to work for scraps as he has had just 25 touches despite all that running. To offer context, his goalkeeper has had the same amount. The heavy artillery is up for Palace and is causing Leicester some problems. Yannick Bolasie's cross is headed back across goal by Scott Dann and Christian Fuchs has to nod clear from under his own bar. Patrick Bamford gets his head to a corner...and Kasper Schmeichel claws away at full stretch. Nothing comes for the free-kick as Leicester stay strong at the back to edge towards three points and cashing in Claudio Ranieri's promise of free pizza when they keep their first clean sheet of the season. Crystal Palace are belatedly coming forward to try and take something from this game. Scott Dann and Brede Hangeland are waved forward for a free-kick. Before it is taken though, Adrian Mariappa is replaced by Mile Jedinak. Jamie Vardy is mainlining on confidence. It is practically oozing out of his pores. The Leicester striker cuts inside and wallops a shot hard but high from distance. Wilfried Zaha replaces Jason Puncheon as Alan Pardew shuffles his pack again. Jeffrey Schlupp slides into the back of Jason Puncheon as the Palace man advances towards the Leicester box. It was needless and the resulting yellow means Schlupp is out of the Foxes mid-week League Cup action. Danny Simpson has his name taken for a rash tackle on Yannick Bolasie. Leicester have made a change in the wake of Jamie Vardy's goal with Shinji Okazaki coming on for Marc Albrighton. Thierry Henry, Alan Shearer, Ian Wright, Mark Stein, Emmanuel Adebayor, Ruud van Nistelrooy and Daniel Sturridge. Jamie Vardy has joined an exclusive club today. His goal against Palace means he becomes only the eighth player - after those listed above - to score in seven successive Premier League games. Van Nistelrooy has the best run of top-flight scoring form having scored in 10 games running for Manchester United in 2003. This is a midfield scrap and there are two players on show adept at doing the business in the engine room. N'Golo Kante and James McCarthur are the deepest players in each midfield. Kante has excelled, making three tackles and a game-high four interceptions. McCarthur has made four tackles - more than any other player. Perhaps unsurprising it was a defensive error which led to the opener in this one. Seven in seven successive Premier League games now for Jamie Vardy. Riyad Mahrez plays the Leicester striker in after a terrible fluffed clearance from Brede Hangeland. Vardy scampers in on goal, lifts the ball over Wayne Hennessey and chases after it to apply a blasted finish from all of two yards. Patrick Bamford is on for Fraizer Campbell. Can he inject a bit of life into Palace's attack? Riyad Mahrez sprinkles a bit of stardust with a flashy stepover that does for Martin Kelly. He is dumped on his backside by a strong covering challenge by Yannick Bolasie. Free-kick Leicester and Jeffrey Schlupp drills a low shot well wide from distance from the set-piece. 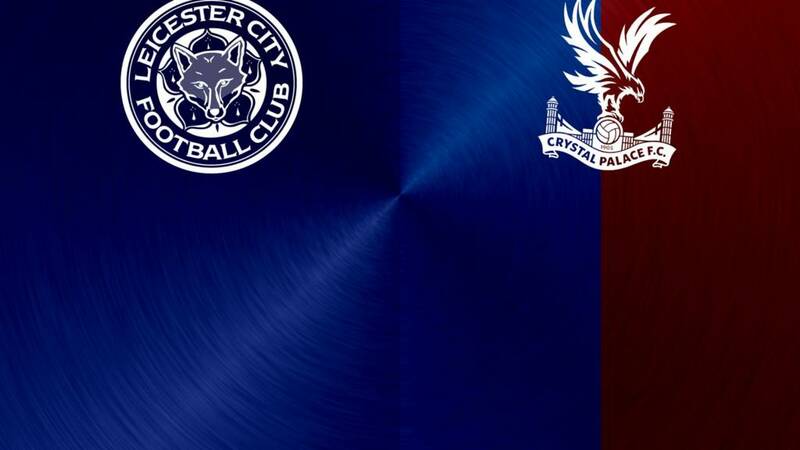 Yannick Bolasie finds a pocket of space on the left edge of the box, but the Palace winger takes too long plotting a possible flightpath into the top corner and Danny Drinkwater gets back to block his ambitious effort at the Leicester goal. Both sides are slandering the good name of football in this one. Marc Albrighton misplaces a pass, Danny Drinkwater follows suit and then French fancy Yohan Cabaye catches the English disease. Marc Albrighton digs out a wicked, curling delivery from the left. It is little overcooked though, floating tantalisingly over the head of Riyad Mahrez. Leicester are under early pressure as Wes Morgan needlessly sticks out a leg to put a Bakary Sako cross behind for a corner. Kasper Schmeichel had that covered. Fortunately for captain Wes, Scott Dann heads wide from the set-piece. Right, the players are back out. No changes for either side as far as I can see. Riyad Mahrez has managed just 24 touches so far in this half. Fraizer Campbell strays a fraction offside as he attempts to peel into space behind the Leicester rearguard. N'Golo Kante gets his name chanted to the tune of 2 Unlimited's No Limits. A worthy reward for stopping a Palace counter in its tracks with two precise tackles on Fraizer Campbell and then Bakary Sako. Yohan Cabaye finally gives Kasper Schmeichel some glovework to warm his hands on. The Palace lynchpin pings a shot in off his left peg from 25 yards. There is a little late swerve on it, but nothing to worry Schmeichel as he keeps his eyes locked on the ball. This game has come off the boil. Leicester's early endeavour is slowing and there is little sign of Palace's underwhelming start improving. The Foxes fans and the noisy travelling contingent are doing their best to lift their men, but both deserve better. The strikers are having to graft at the King Power and graft for little reward. Jamie Vardy (left) and Fraizer Campbell have shared just 13 touches in 30 minutes. The Palace striker may need a hot drink to warm up as he's seen the ball just four times. Alan Pardew is going mental on the touchline, though it's not just at Campbell, he just looks generally angry. Crystal Palace have registered just one shot, and that was blocked at source. Leicester by contrast have managed a total of seven - two on target, three off and two blocked. "Quicker!" yells Alan Pardew, who is looking increasingly enraged. His Crystal Palace team are slower to every ball and their attackers look like they were first introduced to each other in the car park beforehand. Plenty of flicks and tricks up front from the Crystal Palace lads, but it is all little lightweight against the duo of Wes Morgan and Robert Huth. That centre-back pairing could moonlight as nightclub bouncers. Leicester are buzzing about Palace like a nest of angry wasps. They break at speed after winning the ball in midfield and although Jeffery Schlupp's cross is a little too high for Jamie Vardy, the Foxes striker sprints across to make sure that Martin Kelly cannot make a clean clearance. Palace are weathering a storm here. Wes Morgan and Bakary Sako go shoulder to shoulder and the tremours are felt all around the King Power. Morgan stands stronger, shepherding the ball back to Kasper Schmeichel in the Leicester goal. Alan Pardew is filling his half-time rocket with kerosene ready for launch. The Palace manager is getting his heart-rate up on the sidelines, marching and bawling out his players like a sergeant major. Marc Albrighton thumps one straight down the throat of Wayne Hennessey from 25 yards when afforded time and space on the edge of the box. The Foxes have been the brighter, better team after an initial promising first five from Palace. N'Golo Kante sees his name up in King Power lights as the ball bounces invitingly 25 yards out. The Leicester man's half volley soars into the stands behind the Palace goal though. It was ambitious. Rob in Bath: Credit to the Leicester fans for creating a good atmosphere, but those plastic things they bang together are really lame. Jamie Vardy preying on the shoulder of the last Crystal Palace defender, but the in-form Leicester man has been a little over-eager on that one, straying the wrong side and bringing the linesman's flag popping up like fresh toast. Leicester suddenly burst into life. And should be ahead. Three chances in less than a minute as Marc Albrighton's scuffy shot bounces off the post with Wayne Hennessey wrong-footed before Riyad Mahrez shanks the rebound wide. Then Jamie Vardy robs Brede Hangeland by the corner flag, darts down the byeline, and sees a dangerous low cross cleared from under his own crossbar by Adrian Mariappa. Lots of midfield shadow-boxing, but not a lot of punches being thrown in the final third so far. One tune, two sets of lyrics. The Palace fans are chanting "Alan Pardew's red and blue army." The Leicester fans are going for "Jamie Vardy's having a party." Crystal Palace are enjoying lots of early possession. Yohan Cabaye is dropping deep to take the ball off his two centre-backs and pull the strings. Crystal Palace create the first glimmer of a chance. Bakary Sako wins a long ball forward ahead of Danny Simpson, laying the ball into the path of Yannick Bolasie whose early low cross is just in front of the in-rushing Jason Puncheon. Mike Dean is the man in the middle and we are up and running. It is piddling down with rain at the Kings Power Stadium. A very slick surface for zappy passing and long-range slide tackling. Which is the cue for the King Power stadium announcer to rev up the home fans. "Make the difference," he urges them. The fans at one end of the ground are upstanding and brandishing blue and silver foil sheets to spell out "Foxes" in giant letters. Whoever you support, whichever sports you follow, you can now get all the sport that matters to you on one page. In the BBC Sport app, you can now create a My Sport page, this page becomes your one-stop shop with news, live coverage and stats tailored to your interests. My Sport is easy to set-up and edit. You can add or remove topics, and re-order. You can find out more about the new My Sport page here. Map out the road to Premier League glory by predicting the scores for all the games this season. Fancy your chances? Click here to play. The BBC’s FA Cup coverage is starting earlier than ever this weekend – and we want fans to be right at the heart of the action. The BBC Sport website and app will have a rolling live page including goals and updates from all of the 30 matches in the fourth qualifying round, starting at 12.30pm on Saturday. Fans can get involved in the coverage by sharing their matchday pictures from around the grounds on social media using #MobileMOTD. On Sunday fans will get a behind-the-scenes look at the Altrincham v Chester match in our new feature, Mobile Match of the Day. Filmed using only a mobile phone and presented by Radio 1Xtra’s Nick Bright, Mobile Match of the Day will give a unique insight into the dressing rooms, the match action and the fans’ stories. He is the top goalscorer in the Premier League with nine goals, but how good is Leicester's Jamie Vardy? Chris Sutton, who helped take Blackburn to the Premier League title in 1994-95, gave his opinion on BBC Radio 5 live. “His link-up play could be better, but he is confident, he has pace and a real natural effort to his finishing," said Sutton. "He is everything you want in your team at the moment. The great, the good and who? Jamie Vardy can join an exclusive club today. If he finds the net against Palace he will become only the eighth player - after those listed above - to score in seven successive Premier League games. Is Vardy the new Schillachi? Of course you do (if you are of a certain era). Italy striker Toto Schillachi did not play his first season in Serie A until he was 25 and was also a latecomer to international football but, after starting the 1990 World Cup on the bench, he went on to become the tournament's top scorer and a national hero. Can ex-Fleetwood man Jamie Vardy go the same way for England? Ian Wright thinks so. Read his column on the Leicester City striker and Premier League top scorer here. 'Vards' to shoot down 'Pards'? Managerial men of the season? "It's a meeting of the minds of arguably the two most impressive managers in the Premier League so far this season - with an honourable nod to Slaven Bilic too. "Leicester's incredible spirit will surely be tested to the max by a team whose away record since Alan Pardew took charge is only bettered by Arsenal. "From the Palace boss to goal-getting Jamie Vardy, and even including Claudio Ranieri, this is a game fuelled by the desire of the underdog - those who've perhaps been overlooked and under-appreciated once or twice along the course of their careers. "The Foxes and the Eagles are full of those types - finally getting full credit." Bakary Sako is preferred to Wilfried Zaha on the wing for Crystal Palace while Fraizer Campbell replaces the suspended Dwight Gayle up front. Adrian Mariappa comes in for Pape Souare in defence. Palace XI: Hennessey; Mariappa, Dann (c), Hangeland, Kelly; McArthur, Cabaye; Puncheon, Sako, Bolasie; Campbell. Riyad Mahrez returns in the only change to the Leicester starting line-up after being dropped to the bench for last weekend’s draw at Southampton and the win away to Norwich a fortnight before. Shinji Okazaki makes way. Leicester XI: Schmeichel, Simpson, Huth, Morgan, Fuchs, Albrighton, Kanté, Drinkwater, Schlupp, Mahrez, Vardy. Fifth v sixth. Who saw that coming in August? When Palace rolled up at the King Power in February, their two wins from three games under Alan Pardew looked like a classic case of "new manager bounce". A Joe Ledley goal gave them victory that day and the Eagles are now flying high in sixth on the back of nine wins in 12 away games under Pardew. Not as high as Leicester though who are a point and a place better off….